This attractive unit fits in a square box 10 by 10 inches so it is quite large. 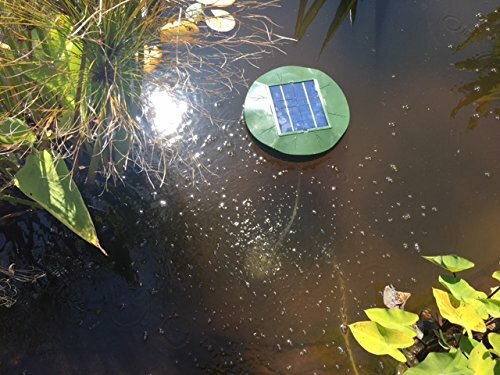 An air stone is connected to the bottom and hangs 18 inches from the unit sending a steady stream of bubbles into the pond when in direct sun. It takes a minute to set up. It has a one year warranty. It's during the summer when the sun is strong and ponds heat up that algae can flourish and fish can be at risk that this unit can help provide extra aeration vital to the health of the pond. Floats on water and works only in direct sun. There is no battery. Good for a small pond 1,000 gallons or less to provide extra aeration. 18 inch air tube to air stone. Takes under a minute to set up. One year warranty. If you have any questions about this product by My Natural Pond, contact us by completing and submitting the form below. If you are looking for a specif part number, please include it with your message.